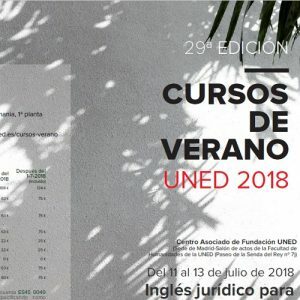 A course organised by Beatriz Pérez and Eva Samaniego on “Legal English for the European Union” will take place 11-13 July in Madrid, Spain. The course focuses on theoretical and practical aspects of legal English. The peculiar features of legal English are studied and practiced, as well as their different registers (informative, specialized, etc.) and the pronunciation. Likewise, fundamental differences between the so-called common law and civil law systems of the European Union are described and it is explained how such differences are reflected in the vocabulary. With regard to the part given by jurists, two aspects related to the European Union and English will be covered: (1) international judicial assistance and international judicial relations and (2) the European prison system. IMPORTANT NOTICE: Several of the sessions will be taught entirely in English, or combining English and Spanish.